Moeen Ali looks back on his last Test appearance in Barbados as the worst bowling performance of his England career and is ready to put things right this week. 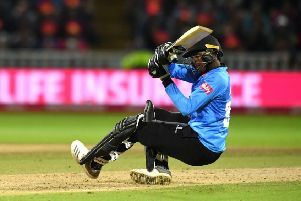 The West Indies turned England over inside three days on their last visit to the Kensington Oval in 2015, securing an unexpected 1-1 draw along the way. Moeen reflects unhappily on his own contribution to that match, a first day half-century offset by the ineffectiveness of his off-spin. Moeen leaked runs in both innings, took modest figures of two for 110 and failed to apply pressure in what should have been a nervy fourth-innings chase. Moeen might easily have missed the tour entirely, having been left out of the original squad due to an abdominal complaint. Instead he was flown out for the final two Tests and appeared light on form, confidence or both. Fast forward four years and his build-up to tomorrow’s first Test could not be more different. He played a central role in the 3-0 whitewash of Sri Lanka before Christmas, taking 18 wickets at 24.50 and is inked in to the XI while his fellow tweakers – slow left-armer Jack Leach and Yorkshire leg-spinner Adil Rashid – await a final assessment of the pitch. However, Moeen is more than happy to go in alone if asked. In the past he has sought to avoid that spotlight, preferring to share his load and even casting himself as the ‘second spinner’ behind less experienced team-mates. “To be honest I’m not too fussed about that any more. Maybe before I was, now I just try and focus on myself and if someone else plays I try to help them out as much as I can,” he said. “I thought we all worked really well together in Sri Lanka but if the responsibility is on myself then I’m happy with it. “I feel like for me to try and get better and think better of myself might improve me. I’ve got to do that rather than almost hide behind saying I’m a second spinner. I try and face it and deal with it. “I feel like I’m at the best age now, I’m 31 and I’ve played quite a bit for England. Moeen’s growing acceptance of his rightful place in the bowling attack, befitting of a man with 163 Test scalps to his name, comes at the same time as a realisation about his batting. Way back in 2014 he carved out a stoic maiden century at Headingley, battling for six-and-a-half hours in a losing cause against the Sri Lankans. He has since shuffled up and down the order at regular intervals, though his appearance at number three in Galle two months ago will almost certainly be his final outing in such a lofty position. “At this particular time, this moment in my career, I don’t have the patience I used to,” he said.